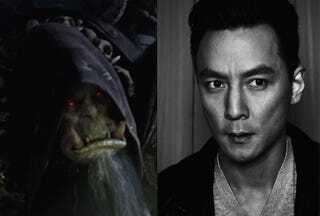 Asian action star and all around good-looking guy, Daniel Wu, is set to play Gul'Dan in the new Warcraft movie. Friday, during the annual all things Blizzard convention, BlizzCon, the Warcraft Company released more information regarding the 2016 movie. Now we know which actors and actresses will play which characters, and that Wu will be Gul'Dan. Chinese video game fans and video gaming press have been eagerly following the development of the movie. The Warcraft series, especially World of Warcraft, is extremely popular in China. The addition of one of Asia's biggest movie stars has also brought added attention to the project. For most Western readers, Wu isn't a household name. He wouldn't be considered well known, not even in the scale of say Onimusha's Takeshi Kaneshiro. That might all change now that Wu is set to play to Gul'Dan. So far it's unknown how Wu will look in the role, but reading the description of Gul'Dan released by Blizzard, Wu's set for a pretty prominent role, or at least one that will get him some decent screen time. The California-born actor has had a different kind of career compared to other Asian American actors. Instead of starting in film in the US, Wu ended up modeling in Asia and then starring in movies in Hong Kong. His breakout role was in 1998's City of Glass, but perhaps his biggest role was the villain in 2004's New Police Story along with Jackie Chan. Now, I'm not ashamed to admit it. Daniel Wu's a very handsome man. I can only wonder and speculate how much he'll have to transform for the role of Gul'Dan. Will be an Andy Serkis affair? Who knows!